Rainer Feistel, PhD, is a physicist and oceanographer at IOW inWarnemünde, Germany, and is the author of four previous books. Günther Nausch, PhD, is a senior marine chemist at IOW, where he works on nutrient cycles and long-term trend observations in the Baltic Sea. Norbert Wasmund, PhD, is a senior marine biologist at IOW, where he specializes in phytoplankton research and is responsible for biological monitoring. 2. General oceanography of the Baltic Sea. 2.1.Specific natural conditions and their consequences. 2.2.3.Stratification and mixing in the channels. 2.2.4.Quantifying the stochastic salt exchange associated with the barotropic water exchange. 2.4.Surface waves, tides, seiches, surges. 2.5.Kelvin waves, topographic waves and eddies. 2.5.2.Coastal trapped waves and continental shelf waves. 2.6.Internal waves, turbulence, diapycnical mixing. 2.6.2.Vertical mixing in the interior. 3. The history of long-term observations in Warnemünde. 3.2.Ship-borne measurements at fixed stations. 3.2.1.Basic oceanographic instrumentation for ship-borne measurements. 3.2.2.Oceanographic observations in the 1950s and 1960s. 3.2.4.Activities in the frame of BMP, 1979-2005. 3.3.Buoy stations and measuring platforms. 3.3.3.Current meter stations in the central Baltic Sea. 4. Weather of the Baltic Sea. 4.3.4.General Vb- and Omega-weather types. 6. Current Observations in the western Baltic Sea. 6.3.Arkona Sea West and Drogden Sill. 6.3.3.From Kriegers Flak to Hiddensee. 6.4.5.From Landtief A to Jan Heweliusz. 7. Sea state and tides. 7.1.1.History of observation and research. 7.1.3.Sea state characteristics and wave generating factors. 7.1.3.4.Wave generating and wave modifying factors (wind, fetch, wind duration, water depth). 7.1.3.5.Special phenomena (air-sea temperature, currents, crossing seas). 7.1.4.Calculation and forecast of the sea state. 7.1.5.2.Wave climate of the coastal zone. 7.2.1.History of tidal research in the Baltic Sea. 7.2.2.Theory of tides in the Baltic Sea and a proper model concept. 7.2.3.Modelling of co-oscillating and direct tides. 8.2.The Baltic Sea and winter time maritime transportation. 8.3.Frequency of ice occurrence in the Baltic Sea as well as mean and extreme ice parameters from representative stations in the period 1956 - 2005. 8.4.Ice conditions in the Baltic Sea and adjacent waters in 1956 - 2005. 8.4.1.Transition area between the North Sea and Baltic Sea. 8.5.1.Maximum extent of ice cover in the Baltic Sea 1720 - 2005. 8.5.2.Ice winter severity indicator - Swedish coast. 8.5.3.Ice winter severity indicator for the Southern Baltic Sea. 8.5.4.Accumulated areal ice volume for the Western Baltic Sea. 8.5.5.Changes of sea ice conditions in the Western Baltic from 1300 to present. 9. Satellite-derived Sea Surface Temperature for the period 1990 - 2005. 9.3.Seasonal, regional, and inter-annual variations of SST in the Baltic Sea. 9.4.Trends in the development of SST. 9.6.1.Upwelling and other dynamical features in the Baltic Sea. 9.6.2.Oder river discharge and Oder flood. 9.6.3.Coastal wind-driven processes along the German Baltic Sea coast. 10. The inflow of highly saline water into the Baltic Sea. 10.2.The causes of MBIs and their basic impact on the Baltic Sea. 10.3.The statistical analysis of major Baltic inflows. 10.4.The analysis of selected events. 10.4.1.MBIs in the 1950s and 1960s. 10.4.3.The very strong MBI in January 1993. 10.4.4.The warm water MBI in autumn 1997. 10.4.5.The specific MBI in January 2003. 10.5.The analysis of baroclinic summer inflows. 10.6.The effects of MBIs and baroclinic summer inflows in the central Baltic deep water. 10.6.1.The effects on the hydrographic parameters temperature, salinity and oxygen concentration. 10.6.2.The effects on inorganic nutrients. 11. BALTIC: Monthly time series 1900 - 2005. 11.4.Monthly time series 1900 - 2005. 12. Nutrient concentrations, trends and their relation to eutrophication. 12.3.Annual inorganic nutrient cycles and long term nutrient trends in the surface layer. 12.4.Inorganic nutrient reservoirs in the deep basins. 13. Trace metals in Baltic Seawater. 13.1.The state of knowledge until 1993. 13.2.Trace metal trends in the western and central Baltic Sea between saltwater inflow events in 1993 and 2003. 13.3.The influence of major saltwater inflow events and stagnant anoxic deepwater conditions on trace metal trends in the Gotland Deep. 13.3.1.Pb, Cd, Cu, and Zn trends "Above and Below Halocline". 13.3.2.Quantification of trace metal fluxes across the redox interface caused by vertical turbulent mixing..
13.3.3.The relation between external and internal fluxes. 13.4.Seasonal particulate trace metal fluxes across the halocline in the water column of the Eastern Gotland Basin. 13.5.Flux and budget estimations of Cd, Cu, Pb and Zn in the surface water of the central Baltic Sea. 14. Sedimentary records of environmental changes and anthropogenic impacts during the past decades. 14.1.Changing coastlines of the Baltic Sea. 14.1.2.The geological/tectonic setting of the Baltic area. 14.2.Recent sedimentation in the eastern Gotland Basin: spatial patterns, rates, and drivers. 14.2.2.Spatial distribution of sedimentation rates. 14.2.4.Vertical versus horizontal fluxes of biogenic elements. 14.3.Reconstruction of pollution history in sediment cores from different Baltic Sea basins. 14.3.2.Field work and laboratory methods. 14.3.3.Sediment properties and age models. 14.3.4.Heavy metals and organic pollutants in the sediment cores. 14.4.Repeated geochemical mapping of the Arkona Basin after 17 years (1988 and 2005). 14.4.4.General sedimentology, hydro- and sediment dynamics. 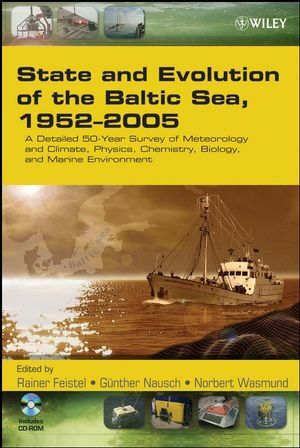 15.1.History of phytoplankton research and methodology in the Baltic Sea. 15.1.3.Primary production and nitrogen fixation. 15.3.3.Primary production and nitrogen fixation. 15.4.3.Primary production and nitrogen fixation. 15.5.3.Primary production and nitrogen fixation. 15.6.Relationship between the different phytoplankton parameters. 16.2.2.Definition of the term "macrophytobenthos". 16.2.4.Species disappeared from the Baltic Sea. 16.2.5.Species invading the Baltic Sea. 16.3.Developments in the Baltic Sea by regions. 16.3.1.Western Baltic - Kattegat, Belt Sea and the southern coast. 16.3.2.Eastern Baltic proper coast and Gulf of Riga. 16.3.3.Western Baltic Proper coast and Archipelago / Aland Sea. 16.3.4.Gulf of Finland and Neva bay. 17.2.How diverse is the macrozoobenthos in the southern Baltic Sea? Analysis of historical and more recent (IOW) data. 17.2.1.History of macrozoobenthic research in the southern Baltic Sea. 17.2.7.Macrozoobenthic diversity in the southern Baltic. 17.3.Macrozoobenthos patterns and dynamic in the Southern Baltic at selected monitoring stations during the last 15 years. 17.3.1.Spatial distribution of macrozoobenthic species. 17.3.2.Temporal changes in the macrozoobenthos distribution in the southern Baltic. 18. Fish Stock Development under hydrographic and hydrochemical aspects, the history of Baltic Sea fisheries and its management. 18.4.Effects of climate- and fishery-induced changes on Baltic fish stocks, and ecosystem structure. 18.5.Cod reproductive success and climate-hydrographic processes. 18.6.Sprat and herring reproductive success and climate-hydrographic processes. 18.8.Climate effects on species interactions and ecosystem structure. 18.9.The potential for a recovery of the Eastern Baltic cod stock and benefits from potentially re-established balanced ecosystem. 18.10.Managing into and out of the clupeid trap - a case for conservation and Baltic ecosystem improvement. 18.11.Influence of contaminants on Baltic fish and fisheries. 19. Description of the Baltic Sea with numerical models. 19.3.Applications of the model system. 19.3.1.Simulation of circulation patterns in the transition area between Baltic and North Sea. 19.3.3.Pathways of salt transports into the Arkona Basin. 19.3.4.Nutrient load experiments and oxygen dynamics. 19.3.5.Transport of suspended particulate matter. 19.4.3.Higher levels of the food web. 20.2.2.Parameters: Codes, units and conversions.